making the US globally competitive? This issue of the Futura Automation newsletter, in conjunction with the Assembly Show in Chicago on October 23-25, is dedicated to Automated Assembly. #SmartMachines will operate autonomously and can communicate directly with manufacturing systems providing Industrial #IoT to #Cloud applications. Assembly systems employing “collaborative robots” or #cobots can work closely with humans for co-assembly tasks and operate safely at slower speeds and with lighter loads. Smart sensors, including #machine_vision systems, will evaluate changing part types, part dimensions, and tool quality to make adaptive decisions, on the fly, to improve production and quality. Artificial intelligence #AI can be applied to solve routine problems and make decisions independent of people, reducing the need for production labor and its cost. Lean Manufacturing is a systematic method for waste minimization within a manufacturing system without sacrificing productivity. #Lean approaches consider the waste created through excess material removal, such as machining away metal (subtractive manufacturing) and labor and energy expended due to uneven work load. Streamlining production, better production planning, use of additive manufacturing techniques (#3D_printing) all allow for a #Lean approach. Industrial #IoT can contribute the data to make waste issues clear and can suggest improvements in production, especially with the development of Artificial Intelligence #AI techniques applied to #BigData. problems and show the way to Advanced Automation – click here to get in touch. We all need a little automation in our lives. Check out our pallet conveyor partner, Glide-Line, for automated assembly applications. This is a great way to manage products through various steps of assembly and inspection. Glide-Line and Futura Automation offer the most versatile multi-strand pallet and panel-handling solution available for the assembly automation industry. We give you powerful pricing, application and model development software (IMPACT!) that is so unique that Solidworks created a Case Study and published it worldwide! Get IMPACT! Futura Automation is honored to be the western USA Sales Rep for Visumatic. Visumatic offers a wide range of manufacturing automation solutions around fastening technologies, both manual and robot automated, like the Viper Assembly Cell. Robot System Products offers a wide range of compact swivel tool changers for challenging automated assembly requirements. 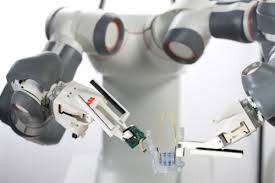 OnRobot is developing state-of-the-art servo robot grippers for fine and precise handling of components during robot assembly operations. They are designed as innovative Plug & Play EOAT systems, including Force Feedback and Tactile Touch sensing that help manufacturers take full advantage of the benefits of collaborative robots. Grippers are being reworked for use on traditional guarded robots. Get in touch for questions and info on the benefits provided by OnRobot grippers. Tesla founder Elon Musk has committed to lead the world in the automation of electric vehicle production. One factor that sets Elon Musk businesses apart from others is his commitment to utilize state-of-the-art manufacturing processes with a heavy application of robotics. He goes where no manufacturer has gone before, and sometimes pays for his boundary busting. Here is a great example of the modern use of robots to build electric vehicles like the Model S.